Prostaglandin H2 is a type of prostaglandin and a precursor for many other biologically significant molecules. 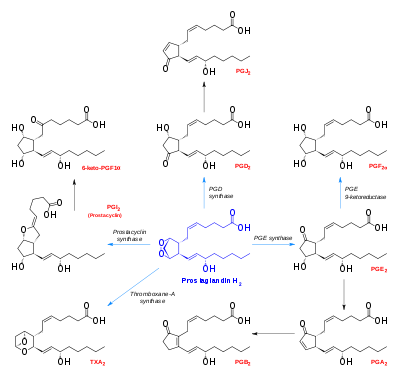 It is synthesized from arachidonic acid in a reaction catalyzed by a cyclooxygenase enzyme. ↑ "The Cyclooxygenase Reaction Mechanism". ACS Publications. Retrieved 18 April 2016.